This past month we took a team of 11 students to Nicaragua to partner with Nadia Garcia, the director of Chi Alpha Nicaragua and at the University of Central America (UCA) in Managua, Nicaragua. It was by far one of the most fruitful mission trips I have ever been on, especially given the short time that we were there, one week. Our students stepped out in boldness to share their faith, pray for the those in physical, emotional and spiritual need, build friendships, and pour into the student leaders at UCA. Sunday was a day of ministry in churches. First, we visited a campus church where we led worship in Spanish and got to pray for the transition of pastors that was happening in the church. We then did three full days of various types of evangelism on the UCA campus on Monday, Tuesday and Thursday. We did sports ministry on Monday morning playing fútbol, volleyball and basketball with students and then sharing some testimonies and about Chi Alpha at UCA with them. Some of our team did a 7-minute drama different places on campus throughout the day and the others shared the gospel after the drama. We also had a number stations on campus including an information table, a prayer booth and a spiritual readings tent. Beyond this our students simply went out on campus and talked to students either in Spanish or tried to find students that spoke English, having spiritual conversations with them, asking them if they needed prayer, and sharing their testimonies with these local students. Throughout this time, we also were passing out flyers for an American Party that we hosted on Thursday where we once again shared testimonies, invited students to follow Jesus and had tons of fun. Over 70 students came to the party and the local leaders of UCA were excited to have the contact information of over 60 new students 30 of whom were very interested in joining the campus ministry. This included 8 students who gave their lives to Christ that we know of. Wednesday we served at a new church plant of the Nadia’s brother. We did door-to-door evangelism in the morning sharing scripture, prayer and prophetic words for people. This may have been an even more stretching time for our team being invited into people’s homes. Still, we continued to see a lot of fruit with 7 more people giving their lives to Jesus, 3 people that we know of healed, and we even did an impromptu baby dedication for a four-day old infant. In the afternoon we did a kid’s outreach with over 100 kids. We shared the gospel with them and their parents and invited everyone we came in contact with that day to return that night for a special service where Brandon preached. All in all, 12 new people came to the church that night and 4 more of them gave their lives to Christ. Many more received prayers for healing and that they would have eyes to see God’s vision for what he is doing in their community (John 9). Perhaps just as exciting as the at least 20 people who came to Christ, over 10 people healed, and even more ministered to and connected with Chi Alpha or a local church was the time we got to spend training and equipping the local Chi Alpha leaders in evangelism, leading small groups, and leadership development. We also saw the formation of the beginnings of what will be a new campus ministry plant on another university as God called 5 students to pioneer on their own campus after we shared at their church bout what God was doing at UCA! Why is this more exciting? Because these students who have been further empowered will lead even more students to Christ over the next years! What was equally amazing was how each and every one of our students grew in their own faith and boldness. Everyone has a story of how God used them and it was so amazing to see God go before us giving us favor in everything we put our hands to. I really believe the seeds that were sewn are going to see multifold growth in the Kingdom of God both in Chi Alpha Nicaragua and Chi Alpha San Diego State this year. The girls took swim lessons for two weeks last month and did amazing. Peyton and Amber both learned the backstroke and Eden is finally putting her head underwater which will hopefully mean that she will start swimming soon. Peyton did very well on her standardized testing. Between her performance during the year and her performance on the test she was chosen for the schools PACE (formerly GATE) program for advanced students. Amber and Eden also started gymnastics classes on Saturdays. Amber was moved directly to the advanced class even though she’s never taken a class before. It’s a testament to her hard work ethic as she works on her handstands, walkovers and cartwheels every day for hours it seems. Kendra fulfilled a dream of hers by serving on a jury for the first time. It was a four-day trial and it was everything she’d hoped for in fulfilling in her civic duty. 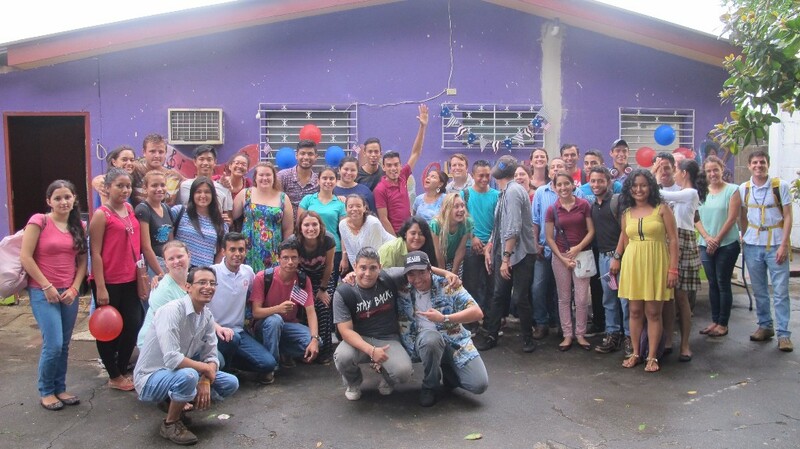 Pray for our students who went to Nicaragua to transition back into their rhythms well but also to keep the new fervor they have for serving God and to cast vision for more students to go on mission trips in the future. We have our second annual Gay Pride Parade outreach this month in connection with Hope Restored Church and Hope Restored Ministries in Hillcrest, San Diego. We saw a lot of fruit last year and are praying for the same this year. We have two more spots to fill in the two houses we run by next month, one in each house. Pray for these spots to be filled with the right people and on time.